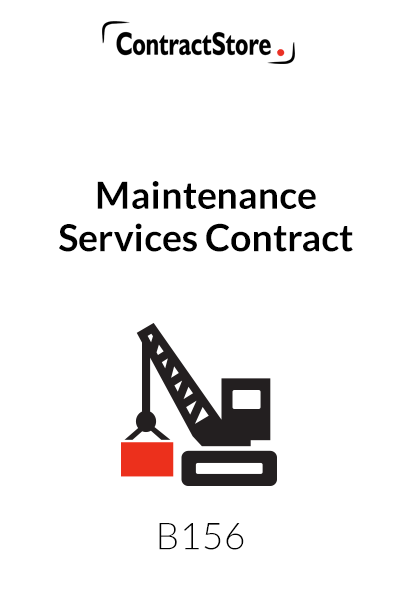 This Maintenance Services Agreement is a straightforward agreement under which a contractor provides maintenance services to a client. Biased in favour of the company providing services, the contract can be used for maintenance of equipment, plant or buildings: details of the precise services will be set out in a schedule together with the fees and expenses. a general clause addressing notices, assignment, subcontracting, the scope fo the agreement, amendments, warranties, severance and waivers. 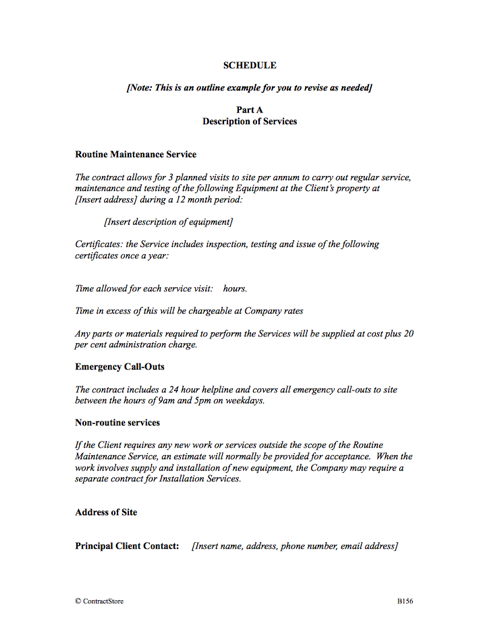 This contract is appropriate for a small to medium-sized business that wants a standard form of maintenance contract for its various clients. 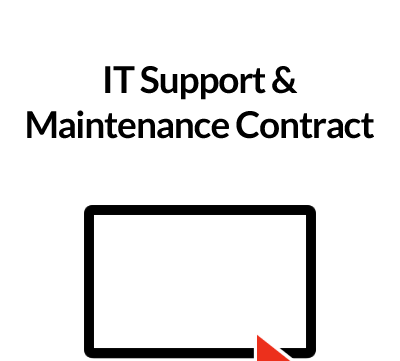 We also have a maintenance contract suitable for a client engaging a contractor – B125. 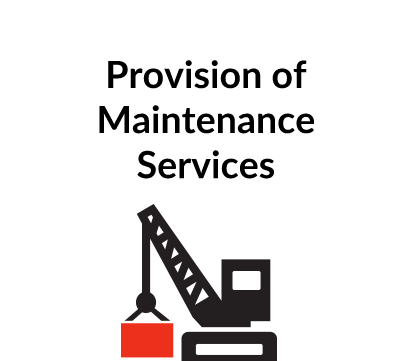 Designed from the Company’s point of view, this Maintenance Services Contract is intended as a template for any company who is engaged in the business of providing maintenance services to a Client. These terms and conditions are intended to be used with a schedule of services and charges submitted by the Company to a Client, and a form of Schedule is included. The Form of Agreement needs to be completed by the Company and Client, and the Terms & Conditions plus other relevant documents sent to the Client. If the Client wants to change anything, it may be necessary to have another Schedule drawn up, signed incorporating the changes. This is intended to make it clear that the Company’s terms and conditions override those of the Client. In practice, this can be more difficult than it appears and legal advice should be obtained. The Client is responsible for giving the Company access to the site when he needs it and for providing facilities such as secure storage for equipment, power supply etc. Responsibility for getting planning consents is with the Client. This refers back to the Schedule to a large extent but in case the Schedule does not cover everything, there is provision for weekly / monthly payment. The Company also has the right to give notice to suspend the work for non-payment (this is a statutory right for construction contracts in the UK) as well as the right to claim interest on late payment. Ownership of all equipment is retained by the Company until everything has been paid for, but risk of loss or damage passes to the Client when equipment is delivered to the site. The Company’s liability in the event of any damage is limited. This will need to be tailored to the particular circumstances but under our clause the Client is responsible for insuring the equipment and services and the Company has to maintain public liability and employers liability insurance. This refers to the initial period of the contract and confirms that the contact will continue unless legally terminated. Under this clause, the Company has responsibility for remedying defects in any Services performed, at the request of the Client. This clause makes it clear that the Company will not be liable to the Client for losses incurred by the Client, and limits the financial liability of the Company under the Contract, insofar as the law allows. This gives the Company party the right to terminate the contract if the Client fails to pay or commits another material breach of the Contract. Either party may terminate the contract if the other party becomes insolvent. The financial consequences of termination are discussed, with particular reference to amounts due to the Company. This clause contains a three stage method of resolving disputes – first, direct negotiation, second a referral to adjudication and, thirdly, the courts of England and Wales. There is information on adjudication in the Free Information (Alternative Dispute Resolution) note on our website.